BOARDS & BIKES — 02/07/2015 — by Christian B. So this really happened! After we heard claims from a ton of bong-smokig surf-dudes living in an landlocked environments, to build an artificial wave and bring wave-garden to their neigbourhood characterized by horrendous rents and ridiculous real-estate prices it finally REALLY happened. And it is looking great Wales! 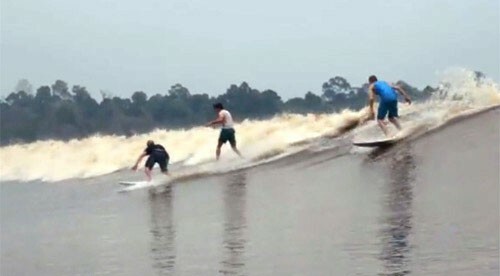 31/10/2014 — by Christian H.
Surfing the Tidal Dream – Hundreds of miles away from the next ocean wave, the Bono rolls its way up through the jungle of Sumatra.